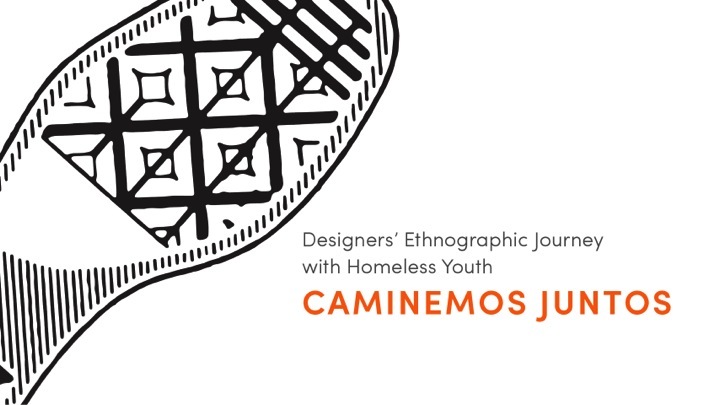 Caminemos Juntos emerged from a 10-week collaboration between 3 MFA students from Art Center College of Design and 3 members of Jovenes, Inc., a non-profit organization that provides support and housing for homeless youth in Boyle Heights, Los Angeles. We redefined our role as one aimed at identifying and amplifying youths' strengths, and rejected the imperative to provide a product that would solve the problem. Creating an interactive and dynamic physical and social space, rich and unexpected perspectives emerged from the youth, ourselves, and the team as a whole. 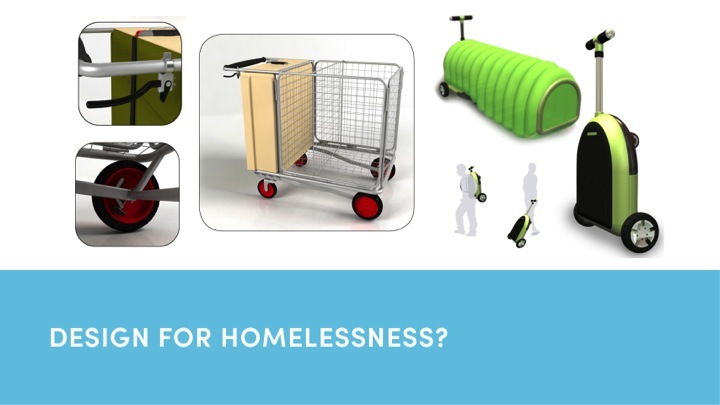 In discovering that the label “homeless” provides little understanding of the people it identifies, we also learned that as designers, we must seek to dismantle those systems of power that dehumanize those we seek to engage. 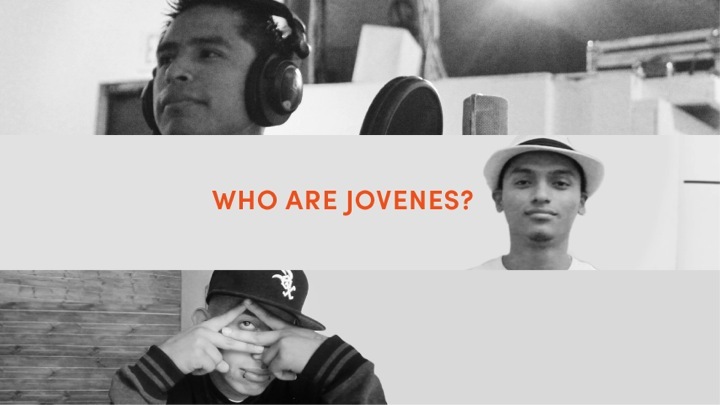 In the beginning, members of Jovenes would cycle in and out of our designated engagements. The challenge was to keep moving forward with members who have been consistent, but also giving equal attention to newcomers so as to not be exclusive. We wanted to be as inclusive as possible without compromising project momentum. Another challenge was to confront the elephant in the room: what does homelessness mean? 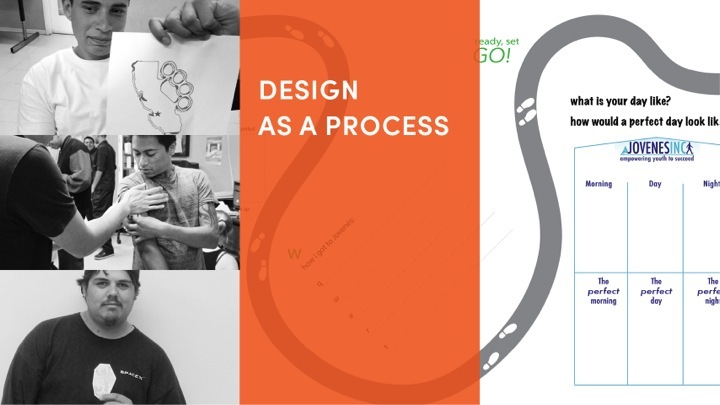 Early on, we had tried exercises such as journey mapping and found that it created a even bigger rift (what we call 'fabulous failure') between designers and members of Jovenes. Thus, in a debrief of that particular exercises, we knew that we had to confront the issue at hand and be vulnerable to each other. In hindsight, the journey mapping exercise was a 'fabulous failure' in that it helped both designers and members of Jovenes to move away from stereotypes of one another. We created the “Pass the Mic” exercise to help us get comfortable talking in front of each other and diffusing the aspect of directly voicing comments to a specific person by having each of us talk to a recording camera. 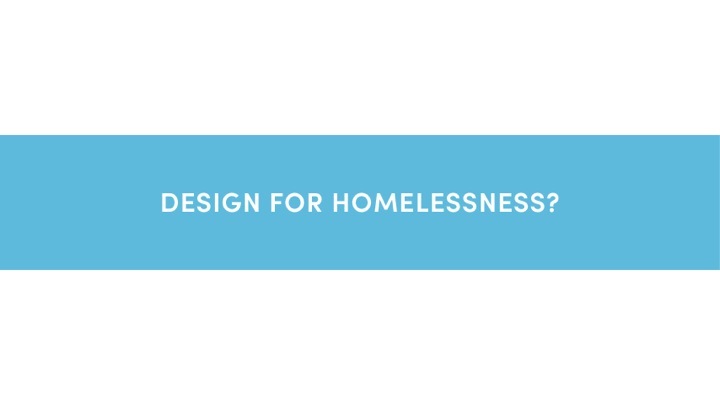 We created questions such as: what does homelessness mean? What do you want people to know about you? 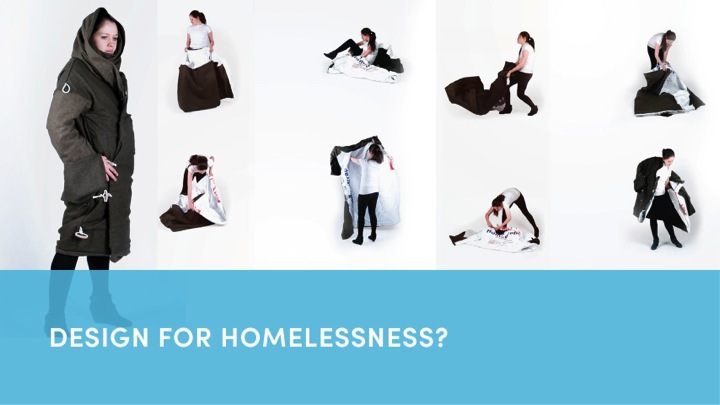 What do you think when you see someone homeless on the street? These questions were for both designers and members of Jovenes to answer in front of a camera and in front of each other. The gesture of passing the mic added a ritualistic element to the exercise, signifying passing on authority and community permission to the individual to voice his or her perspective. It enhanced the feeling of mutual respect and individual empowerment. The visual images produced by that moment were unexpectedly powerful. Using the technology in this way created a shared experience and more equitable playing field, helping to tear down the differences between designer and youth. 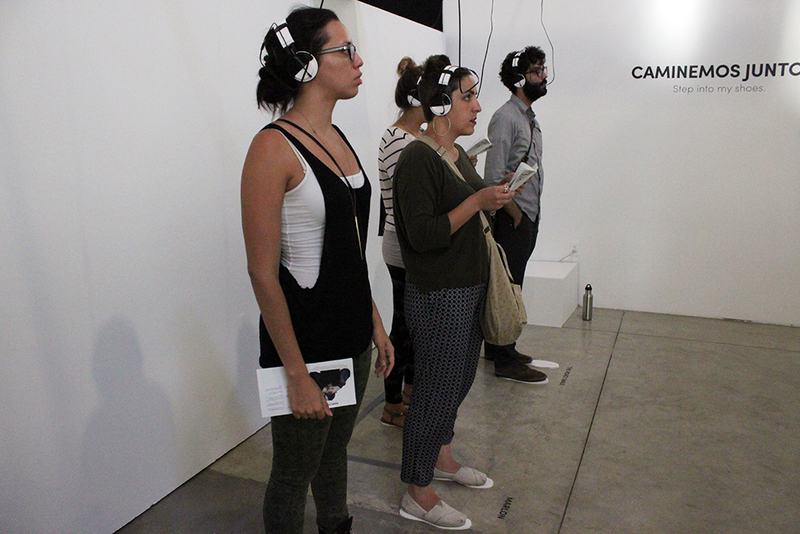 The result was a suite of interactive design research tools and experiences, culminating in Caminemos Juntos (Let's Walk Together), a multimedia installation presenting the youths' own perspectives and stances. By relinquishing authorial control most commonly wielded by designers, we rejected the power dynamics inherent in the conventional design research process for the reason that it was not productive in our engagement with each other. Our work showcases the youth’s talents through a carefully constructed, participatory design process that sought to privilege youth voices. Teamwork was paramount to the success of the project. 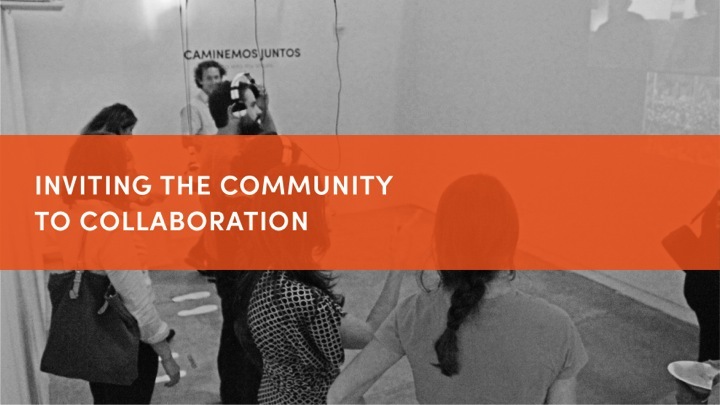 While all 3 designers worked collaboratively to plan, design, and lead during our sessions with Jovenes, the execution process of the interactive installation was divided. I was tasked with executing the technology aspect of the installation: programming sensors to trigger a video via Arduino, Processing, and DIY sensors.